As you head South towards the Keys from Miami your guide will take you through the southern portion of the Florida Everglades "America's Wetland." This portion of the Everglades introduces you to the diverse ecosystem that feeds down into the Florida Keys. Before you begin crossing open water we will stop and sample fresh local food, have a drink, and immerse you in the relaxed state of mind that is a trademark of the Florida Keys. Once in Key Largo, we traverse a massive coastal subtropical forest, one of the last still standing in the country. We then explore a Wild Bird Sanctuary where a dedicated team of specialists and volunteers take care of injured birds. The sanctuary provides an incredible opportunity to get up close to some of the raptors, wading, and shore birds of the region. After the sanctuary you will continue south while your guide shares fascinating stories about the people who have lived in the Keys. From Native Americans that first made the Keys home to the pirates, wreckers, sailors, pioneers and Bahamians who ruled the waters and settled on the islands over three hundred years ago. Their stories are fascinating and very entertaining! Our next destination is Islamorada, where we stop at one of the best beachside restaurants in the Florida Keys, The Morada Bay Beach Café. The Beach Café serves fantastic Caribbean and American cuisine in a picturesque setting on the beach. After lunch, our tour heads a little further south to a Florida Keys staple...Robbie’s Marina. Once at Robbie’s, you can enjoy a beverage and peruse the local outdoor arts and craft market or feed the famous giant tarpons. Once you have found a Florida Keys souvenir we head back to Miami. 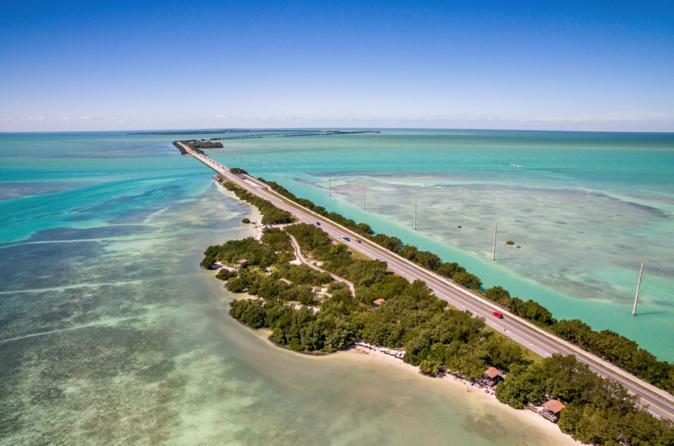 You will be happy you visited the Florida Keys while you are in Miami….we promise!